When Will I Get My Postcards with Mailing Services? 10,000 or fewer Postcards with Mailing Services: Dropped at the Post Office 4 business days from proof approval. Over 10,000 Postcards with Mailing Services: Dropped at the Post Office 7 business days from proof approval. Interested in direct mail postcards? There’s a good reason small businesses and marketers everywhere rely on us for postcards with mail services. 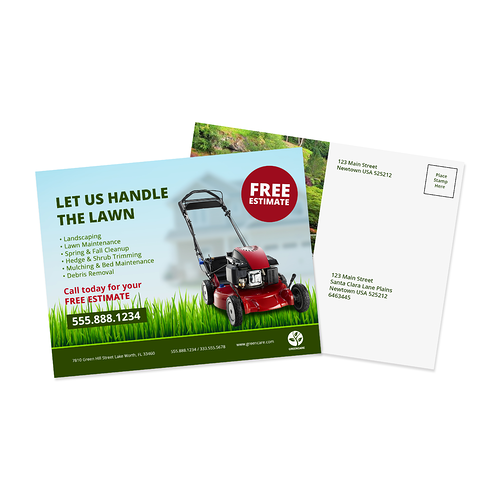 Direct mail postcards give you a lot of marketing power for your dollar. Compared to digital marketing, postcards have better response rates and a superior return on investment. OOrder your direct mail postcards printed on one or both sides in full color. Choose between a variety of USPS-ready sizes from a petite 4.25” X 5.5” to a whopping 6” x 11”. All postcards are printed on durable 14 pt. card stock, coated in your choice of gloss or matte at no extra charge. You can also coat the front of your cards in high-gloss UV for more vibrant colors and a dramatic flair recipients won’t forget. Submit a domestic or foreign mailing list or rent a residential mailing list or commercial mailing list from us. From the time of your proof approval, it will only take as few as four days for your postcards to be printed, addressed, sorted, and in the mail to your customers. It’s that easy! Above services included in $85.00 list processing fee per list. Postage and processing quoted during checkout. All postage transactions are subject to a 5% administrative and handling fee. Order your direct mail postcards with mailing services today.